Established in 2000, Dr. D.Y. Patil College of Physiotherapy is considered as one of the premier institutes of Physiotherapy. It is recognized by the Indian Association of Physiotherapists (IAP) and the Maharashtra State Council of Occupational therapy and Physiotherapy (MSCOTPT). The College offers graduate, post graduate and PhD programs. Physiotherapy has evolved as an important component of modern health care. It focuses on restoring movement, helping people maintain and maximize their physical strength, function, and overall well-being by improving their activities of daily living. The BPT Program on offer is of 4.5 years! It whole Program is divided into 8 semesters! On the other hand, the MPT Program is of 2 years divided into 4 semesters. Post Graduate specializations are offered in Pediatrics, Musculoskeletal Science and Hand Conditions, Manual therapy, Sports, Community Based Rehabilitation, Orthopedics, Neurosciences and Cardio-Respiratory Sciences. Post-Graduate Diploma in Manual Therapy (PGDMT-) and Certificate Course in Physical Fitness Training (CPFT) are also on offer. The duration of the courses is 1 year and 6 months respectively! Students can also pursue their PhD degree from the College! Every year, value-added courses are conducted for students. Reputed national and international experts are invited to seminars and workshops to address the students. The college arranges campus placement interviews for outgoing graduates. In compliance with the norms set down by the IAP and MSCOTPT, the College building has been appropriately designed and fully equipped with lecture halls, laboratories, an exclusive ‘Skills Lab’ with simulation mannequins to provide hands-on practical training to the students. The lecture halls are provided with smart boards and LCD projectors. 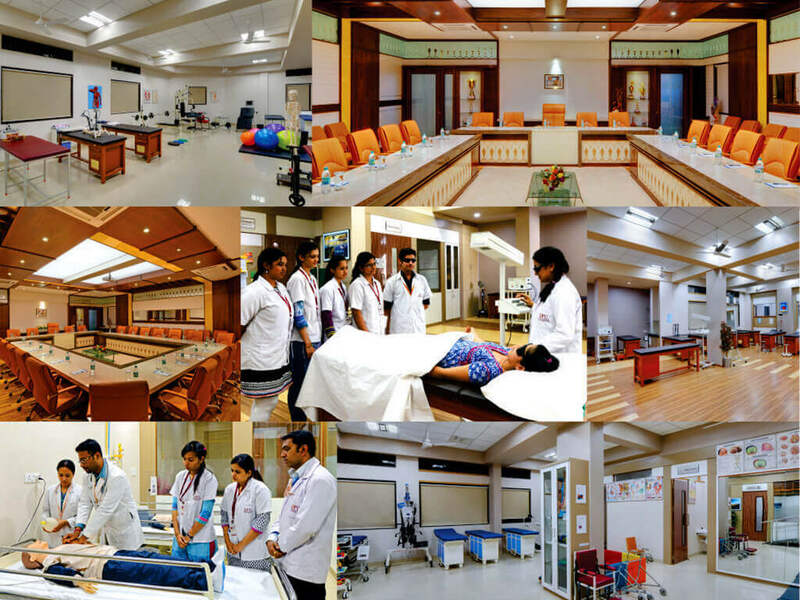 The College also possesses a variety of advanced diagnostic, therapeutic modalities and instruments, utilized for treatment and research work. Highly qualified and well experienced faculty avail the best teaching practices like integrated teaching, journal clubs, seminars, case presentations, multi-diagnostic camps etc. Faculty members actively attend National and International Conferences, research publications in various national as well as international journals. All faculty regularly update themselves by attending Faculty Development Programmes to hone their teaching and mentoring skills. Projects and demonstrations keep students updated with current knowledge of recent advances in the field. Students are also encouraged to participate and present research papers at various national and international Conferences. Parent-Teacher meetings are regularly conducted to ensure parents are updated on teh overall progress of their wards. The College boats of a library with an impressive collection of books, physiotherapy magazines, national and international journals. A well equipped computer lab with internet connection and Wi-Fi access is available for students and faculty for carrying out various academic activities. On the clinical front, the Physiotherapy OPD of Dr. D. Y. Patil College of Physiotherapy is well appointed with modern and latest equipment’s like Aquaciser, Balance Master, Scanning LASER Therapy, Matrix Therapy and Lymphostim, along with other advanced electrotherapeutic modalities and exercise equipment for pain management. The OPD runs 8 specialty clinics (Hand, Obesity, Spasticity, Pain, Knee, Spine, Endurance and Cerebral Palsy) which are open on different days of the week. The OPD renders the best possible treatment to patients, and give hands-on experience to students. The alumni of the college are spread across the world. They are still in touch with their alma mater and often participate in different activities organized by the college.